Nita and Kit are enjoying the remainder of their summer holiday. All is quiet until the day when Nita's family get their new computer. Nita's younger sister Dairine - who has been itching to become a wizard like Nita and Kit – works on setting up the computer and in the process she discovers that the new machine is very special indeed. It is loaded with a "beta" version of the wizard's manual – a computerized version of the book Nita and Kit have. What Kit and Nita do not know is that Dairine has taken the wizard's Oath using Nita's manual and she is now going to have to go through her novice's ordeal. Unfortunately Dairine did not take the time to read Nita's manual properly and she does not fully appreciate what taking the Oath entails. Without much thought Dairine uses the magical computer to transport herself out into space. She visits a number of planets and then ends up in a place where creatures from all kinds of planets come for travel purposes. It is basically a massive airport of sorts though the travelers do not use planes as such to get from place to place. It is while she is here that Dairine begins to realize that someone or something is out to get here. Strange looking alien creatures begin to pursue her and it is only by sheer luck that she is able to get away before she is blasted to nothingness. Dairine transports herself to a very distant planet, hoping that it will take a while for her enemies to find her. When she has a moment to think she realizes that her enemy must be the Lone One and therefore she is in a very precarious position. She has a little while to prepare herself for It's attack but she soon finds herself absorbed in a fascinating project. The planet she is standing on has an enormous computer chip on its surface – and the chip is alive. Dairine cannot resist trying to find a way to communicate with the computer. And then she cannot resist doing what she can to expand the possibilities of this incredible new life form. Meanwhile, on Earth, Kit and Nita have discovered what Dairine has done. They have no choice but to follow the young girl and hope they can help her through what promises to be a very grueling Ordeal indeed. All they can do is hope that they will be able to find her before it is too late. 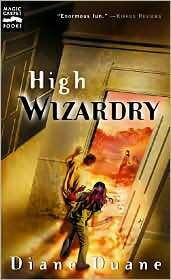 In this third book in the Young Wizards series, Diane Duane takes her readers on an extraordinary journey into space. Readers who have a fondness for astronomy and computers will find this tale utterly captivating. It is also very thought provoking as it explores the idea that we all have the ability to make the world a better place, if we are willing to face our own failings and use our gifts for good. The hard part is finding the courage to do so.